Like most things, it began with a birth and ended with a funeral - and in between took in copious amounts of love, hate, and - inevitably - illness. Westway, the eponymous medical centre of BBC World Service's soap opera, closed its doors for the last time on Friday as the programme ended after eight years. The announcement that the twice-weekly programme was to end was made in April, when World Service commissioners decided that, in a revamped schedule focusing more on news and factual programmes, there was simply "not enough room" for it. While the first episode featured a teenager giving birth, the last featured the funeral of Jamshed Dastoor, the super-efficient practice manager at the health centre - which, appropriately enough, was a "celebration" of the character's life. "I'm extremely sad that Westway is ending because I think it is unique," said programme editor Ros Ward. "There are a lot of excellent radio and TV soaps out there but I don't think any of them has such a culturally diverse audience and can cover the range of challenging, topical, provocative and entertaining stories that having a worldwide brief allows." Certainly, Westway established a tradition of involving its listeners in innovative ways. The last episode featured the name of Sadie Devani, a listener who won a competition to have their name included in the script for the final transmission. Last year, another competition ran for listeners to create an entirely new character. It was won by a 69-year-old Singaporean, Ron Chandran-Dudley, who created 27-year-old Chinese-Singaporean physiotherapist Zoe Chan Li Fen. 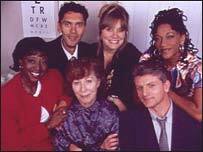 Zoe, played by Wendy Kweh, remained in the soap until the final episode - as did Joy Onwukwe, appointed as a doctor in the first episode, back in 1997. "The last day of recording was very special," Ms Ward said. "Most of the central characters are played by actors who have been with the show from the very beginning so they feel like family. "Everyone wore black and there was sadness - but also anger and incomprehension that a show that was still being excellently received by listeners could go like this. "At the same time, we celebrated the last eight years together and there was a great deal of fun, as there always is at Westway recordings." She added that fans of the programme - which attracted an audience of around 1.7 million - had been "extremely upset and disappointed" by the decision to axe the soap. "The show was popular all over the world and with all kinds of people," she said. "There have been some very touching e-mails that have shown that Westway has made a real difference to people's lives - including one doctor who listens to the show for insight into health problems that he doesn't necessarily encounter in his part of the world." 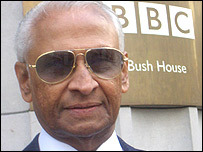 BBC World Service director Nigel Chapman said Westway had done a "good job" for the World Service, "and for its listeners around the world". "It's shone light on the way Britain is changing, and helped people understand that," he added. "But as our radio services in English have changed, and people tell us that they want more speech-based news and information, delivered in a more consistent way, it's become harder to find the home for it." Westway, has, however, not disappeared from the airwaves altogether - the early days of the soap are now being broadcast in the UK on digital station BBC7. An omnibus of the last episodes of Westway, together with a feature looking at the history of the programme, will be broadcast on BBC World Service at 1000 GMT (1100 BST) on Saturday 29 October.